Thanks again for your great business ethics…. Just wanted to let you know how happy we are with our door. Tim, the installer was great. 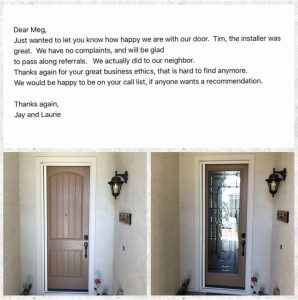 We have no complaints, and will be glad to pass along Referrals. We actually did to our neighbor. thanks again for your great business ethics, that is hard to find anymore. We would be happy to be on your call list, if anyone wants a recommendation.